You will find the Blue Mountains in Sydney, well just an hour or so west of Sydney. The World Heritage listed Blue Mountains are green (and sometimes blue) but always gorgeous and right on Sydney’s doorstep. The Blue Mountains form part of the Great Dividing Range that stretches most of the way along the east coast of Australia. They ultimately give way to a plateau and a mix of bush and farmland. 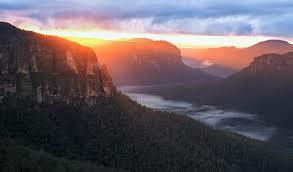 The Blue Mountains provide excellent adventure opportunities, superb bush walks and breathtaking scenery. Part of the appeal is the contrast with Sydney. Both are beautiful yet at the same time so different. You can also celebrate Christmas in July and you might even see some snow. The Three Sisters are the most popular of Blue Mountain’s attractions with many thousands of visitors every year. Once you have arrived in Katoomba you just need to just follow the signs to Echo Point. If you don’t have a car jump on board the local tourist bus. When you arrive at Echo Point walk across and down to the viewing platform and Wow! There they are! The Three Sisters in all their glory – unless it’s cloudy of course. 🙂 It is fantastic that we can experience such an amazing sight so close to Sydney. If the Three Sisters is your first stop you are faced with a big bushy dilemma. What next? There is so much to choose from. A trip to see the beautiful Wentworth Falls is another popular thing to do in the mountains. The falls are roughly an hour round trip from the nearest car park and are well worth the walk. For a little adrenalin rush (just a small one) catch a ride aboard the steepest passenger railway in the world. Going down!! Bet you feel more like walking now. 🙂 The Grand Canyon, Federal Pass and many other paths will lead you to breathtaking lookouts and memorable experiences of the wilderness. Just be sure you are well prepared if you intend going on a long walk. It is certainly possible to get a feel for the mountains in day. Personally I’d suggest a night or two to ensure you come away with some great memories. If the weather goes sour your trip will be affected so a couple of days or more gives you a good chance to truly ‘see’ the Blue Mountains in all their splendour. Many of the buildings in the Blue Mountains are ‘as old as the hills’. It can feel like a step back in time when confronted by faded wallpaper and high ceilings. Mostly this is a bonus, quaint you might say but if that kind of thing bugs you choose carefully where you stay. The New Ivanhoe Hotel is another example of the old worldliness of the Mountains. The 80 years young Ivanhoe is cosy in the cold with its open log fires. In summer there is plenty of natural sunlight on offer through the enclosed garden patio(s). You can overnight at a reasonable price in one of the seven double rooms and three twin rooms with share facilities or in one of the large double rooms with ensuite. Look out for the bright flower-filled window boxes outside the bistro. Inside you can enjoy some good pub food for not very much. Make sure you visit the Tourist Information Centre in Katoomba for more information. On a hazy day the Blue Mountains may earn their name, maybe. One thing is for sure, Australia is the flattest continent on Earth so don’t expect snow-covered peaks! Maybe during winter you might see some snow but that’s about it. If it is snow you are after have a quick look at Ski in Sydney and watch the brief video. On the subject of weather, if it’s cloudy be patient as it may just blow away. If poor weather has set in consider a trip out to Jenolan Caves (see below). Jenolan Caves is a four-hour drive out of Sydney. There are numerous caves to look at and crawl around. Jenolan is well worth the journey if you like the cool, dark and damp. The trip out will give you a good look at the Blue Mountains (but you have to go a fair bit further west for the desert and the real outback).